Anyone who has food allergies knows that eating out can be a challenge. I often look up restaurant menus online to see if they have gluten free options, and quite frankly, my likelihood of going there increases with even the slightest mention of gluten free offerings. Recently, I went to the British Beer Company and was pleasantly surprised with how great their gluten free menu was. Definitely one of the best I have seen. I was so impressed with the gluten free menu at the BBC, that I went back for a second meal just a few days later! 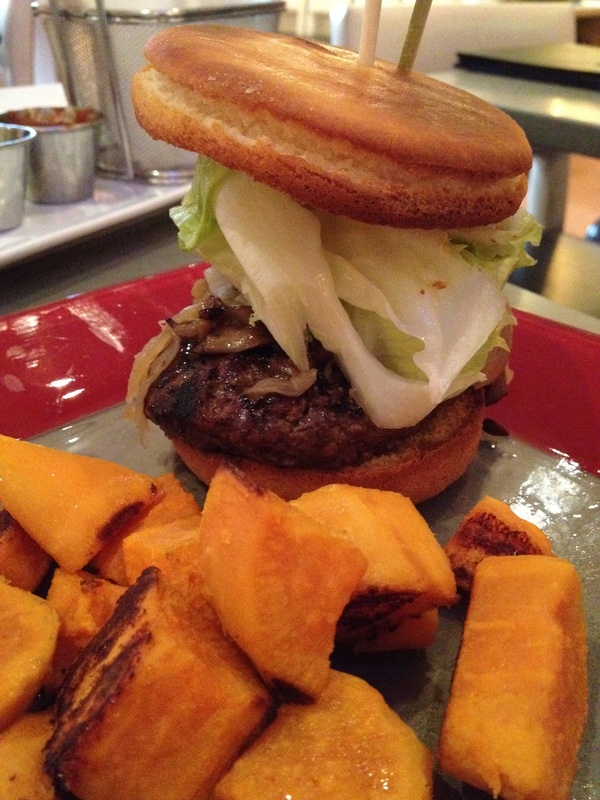 In addition to usual gluten free items such as salads, they offer sandwiches, burgers, and even pizza gluten free. I will have to go back to try their pizza soon. 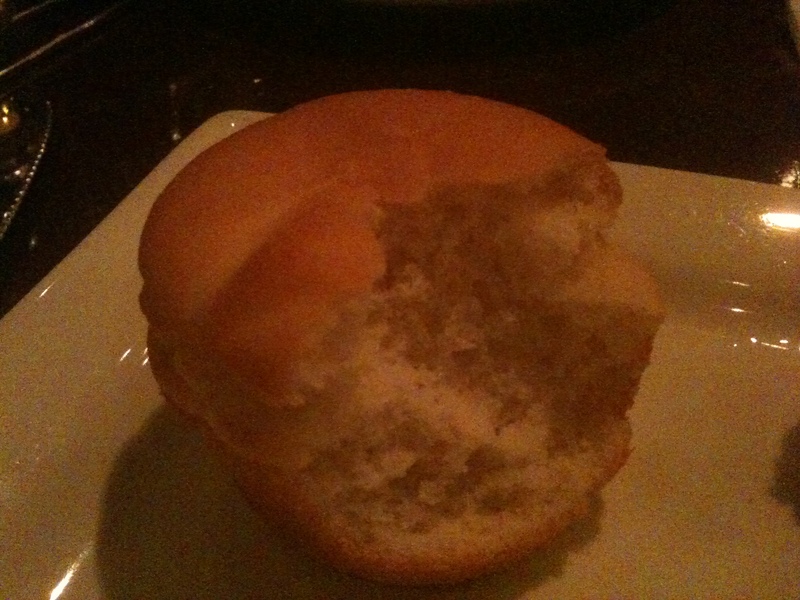 Bread items are always so crumbly when they are gluten free, but this was pretty good. Minimal breakage. 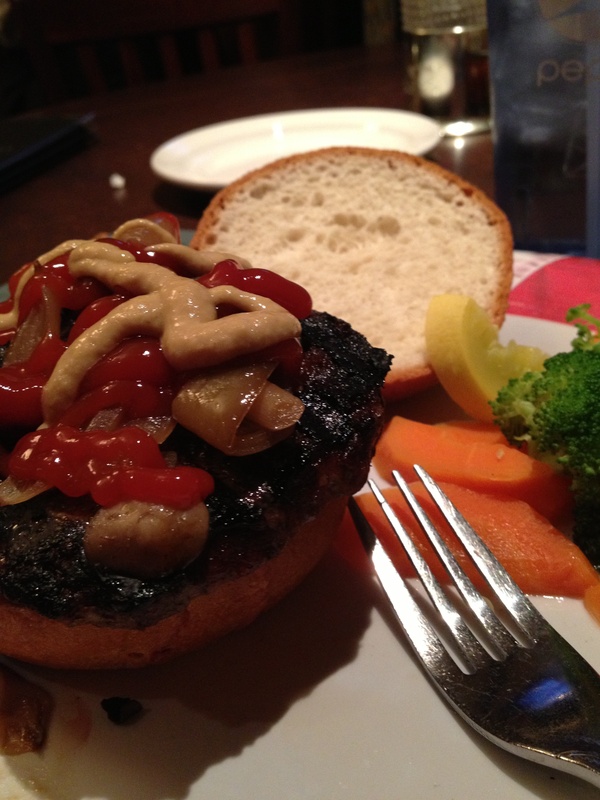 My second meal was a burger smothered with mushrooms and onions on a gluten free bun. Needless to say, I will certainly be back to the BBC! Thank you for making a stellar gluten free menu. While exploring my new neighborhood, I am finding my new favorite restaurants. I recently came across Wiked Restaurant and Wine Bar. It has become one of my new favorites! They have a solid menu for lunch and dinner, and can do just about anything on their menu as gluten free. I especially like that they make pizza gluten free! Gluten free pizza is so hard to find. I have been there three times already, and have enjoyed great meals, so I wanted to share! A very tall mushroom and onion burger on a gluten free bun. With gluten free sweet potato fries. Veggie Lovers pizza with goat cheese. I highly recommend Wiked and am sure I will be back there again soon! In the process of moving, I have been eating a few meals out in an effort to clean out the fridge. Or maybe it is just an excuse to sample some local flavor! Either way, I have come across some great restaurants with gluten free fare. I have mentioned a couple before, but they need to be mentioned again for their outstanding dishes. The Met Bar in Dedham, MA. (They also have other locations). 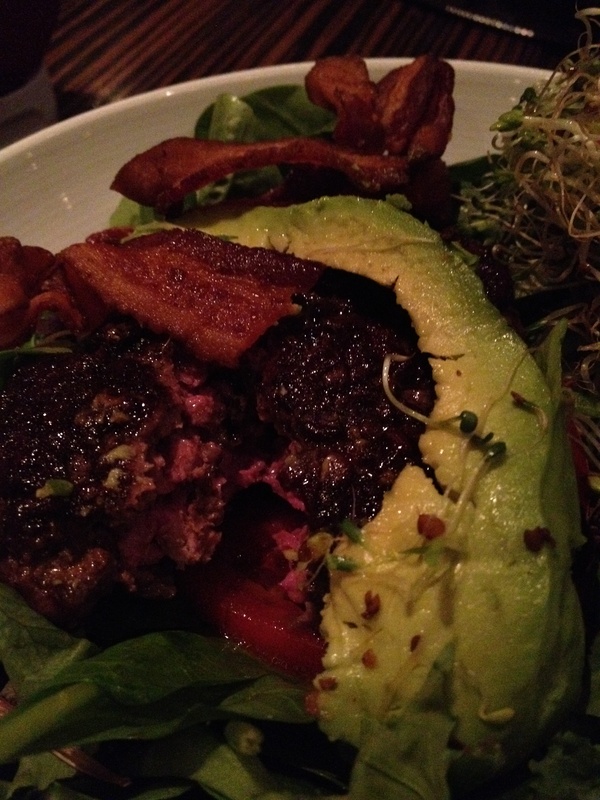 A bunless burger, topped with avocado, bacon, and veggies…. along side gluten free sweet potato fries! Joes’ American Bar and Grill in Braintree, MA. (Also have other locations). 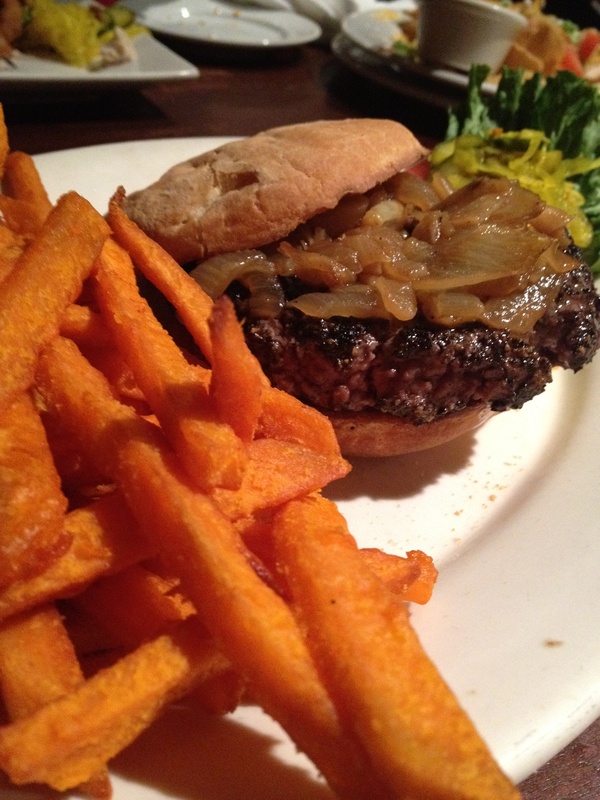 A burger topped with carmelized onions, on a gluten free bun with gluten free sweet potato fries! I usually don’t have so many options for my side, but Joe’s has so many potato sides that are gluten free. Gennaro’s Italian Restaurant in Quincy, MA. Gluten free pasta with chicken, eggplant, proscuitto, and a pesto marinara sauce. It’s been so long since I have had pasta in a restaurant! Easy Pie in Braintree, MA. 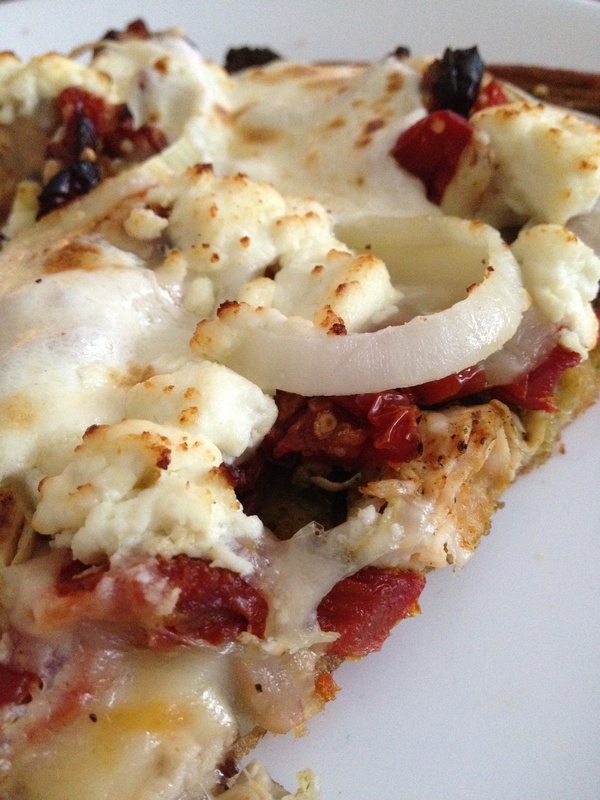 Gluten free pizza topped with a mound of goat cheese, onions, chicken, red peppers, sun dried tomatoes, and pesto. Amazing flavor combo. Happy Allergy Free Eating Out! My posts will be a little sporadic as I move, so I apologize in advance. I’ll be back soon! 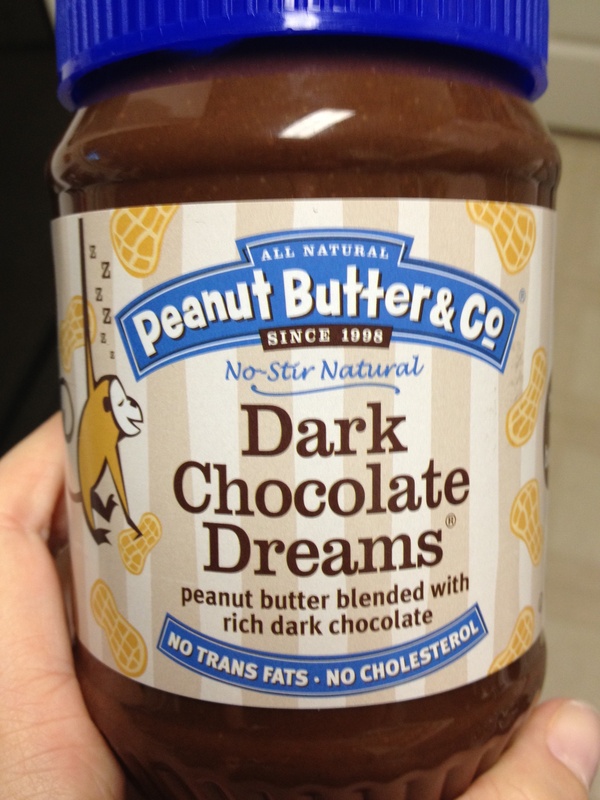 I just wanted to share some gluten free goodies I have recently found and enjoyed! The more gluten free products I find, the more choices I have and the less it feels like a compromise… and the more tastes I can enjoy. 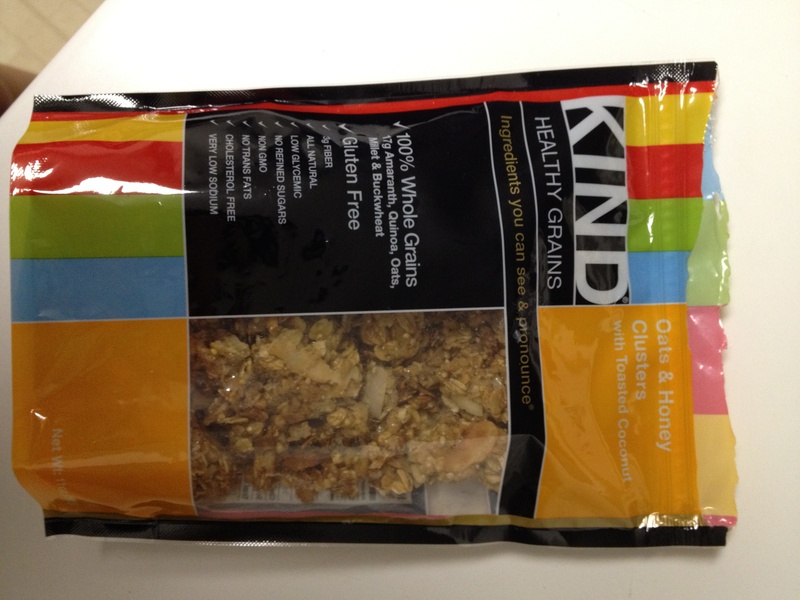 I love those KIND bars that are full of nuts and seeds… and recently found granola! Perfect in the morning with some soy milk. There are so many flavors, too. 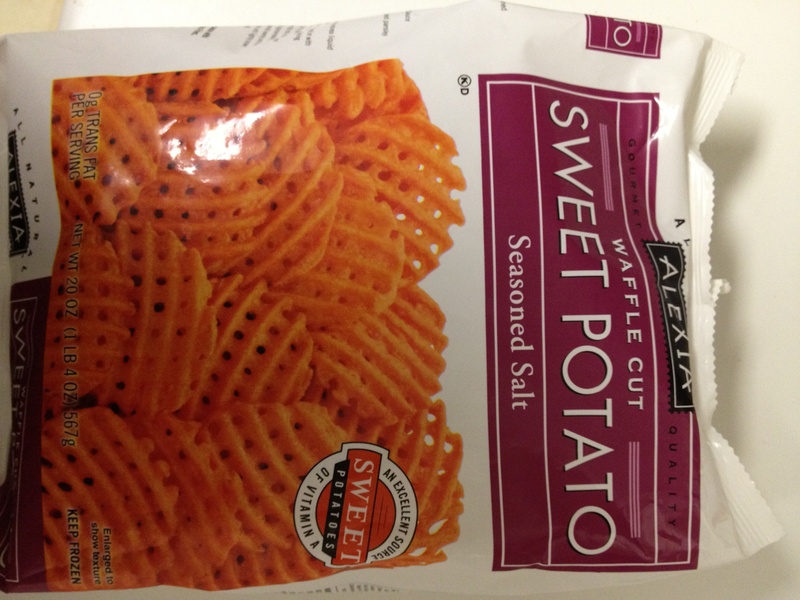 I LOVE sweet potatoes and sweet potato fries… but fries are so hard to find gluten free. 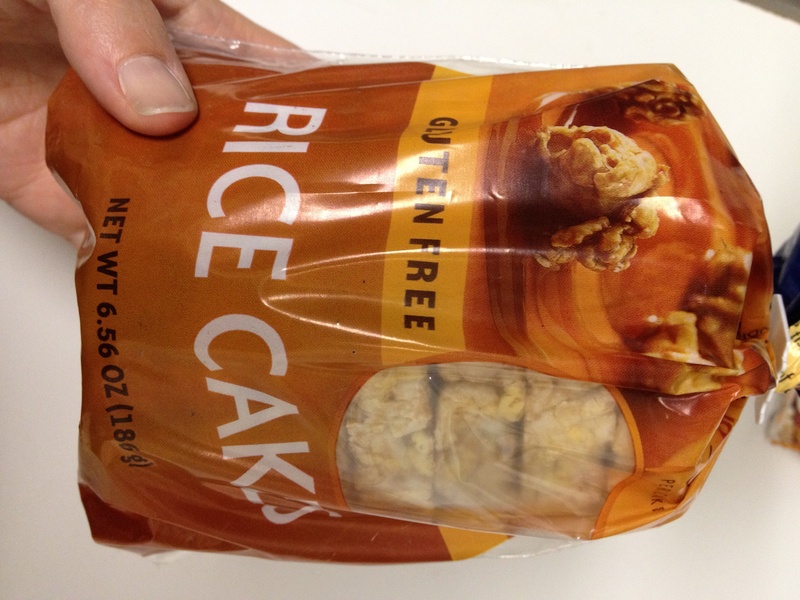 These don’t say gluten free right on the package, but are make with rice flour and oil…. and taste delicious. My new favorite afternoon snack is a gluten free caramel rice cake with some dark chocolate peanut butter spread… which is also gluten and dairy free. Also perfect for dessert! And the best find of all (from the recommendation of a good friend)… dairy free JP Licks ice cream! I tried some for the first time tonight and really enjoyed it. I had the coffee lace flavor, and can’t wait to try the others… chocolate fudge, cow trax, and other fruity ones. Happy Mother’s Day to all the wonderful women in my life! 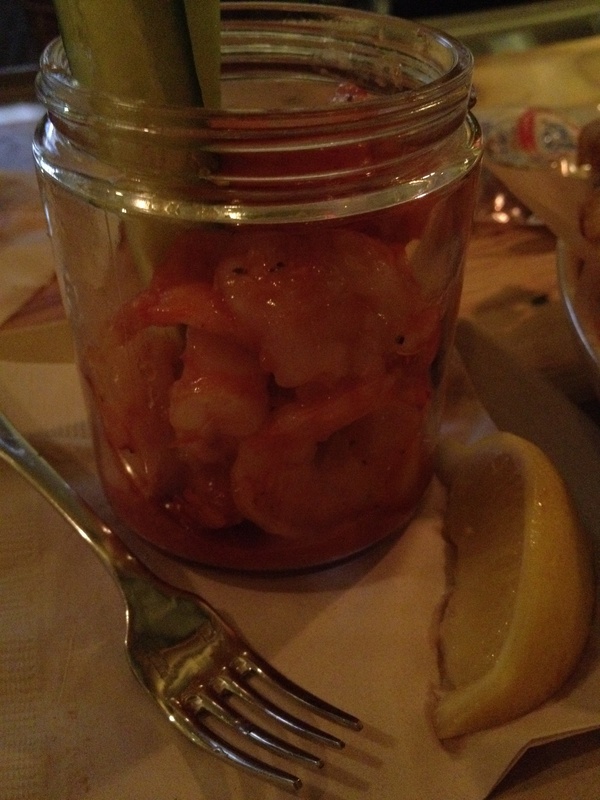 In the spirit of taking Mom out to eat, I wanted to share a few recent restaurant visits that offered gluten free fare. 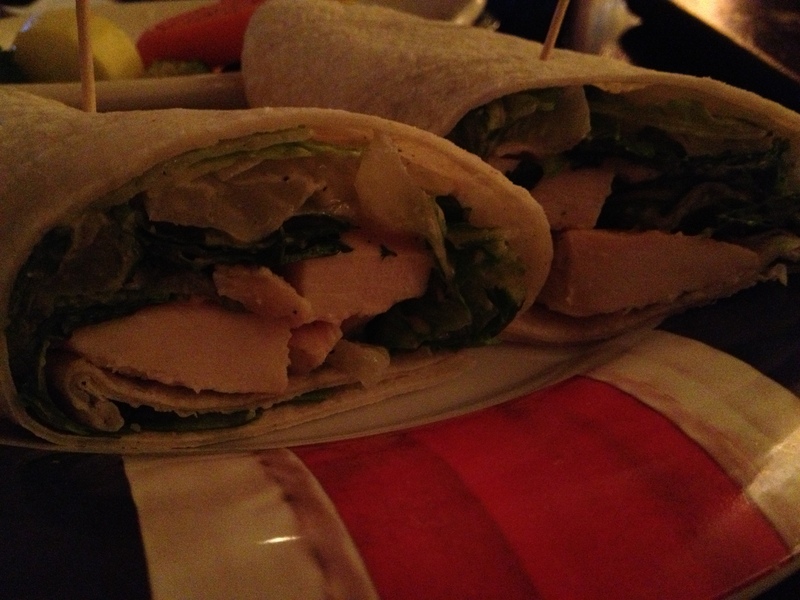 I recently went to the MetBar with my mom. 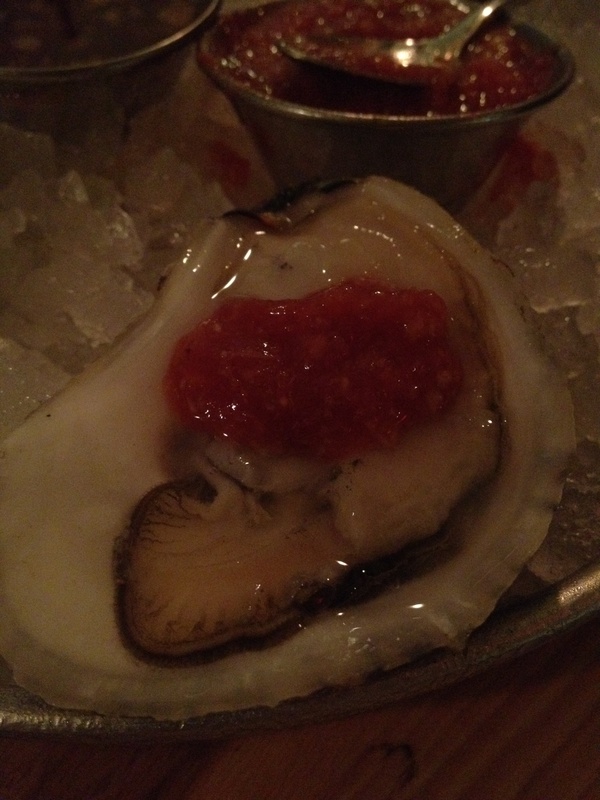 MetBar has a few locations, including Dedham, Chestnut Hill, and Back Bay. I have enjoyed their gluten free menu at all locations. 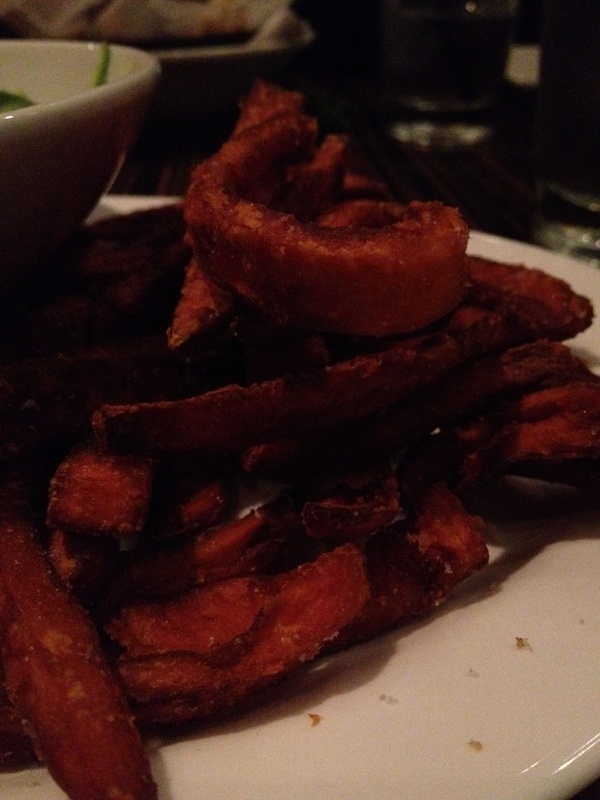 In Dedham, they happily made me gluten free sweet potato fries… a true luxury for gluten free fare! 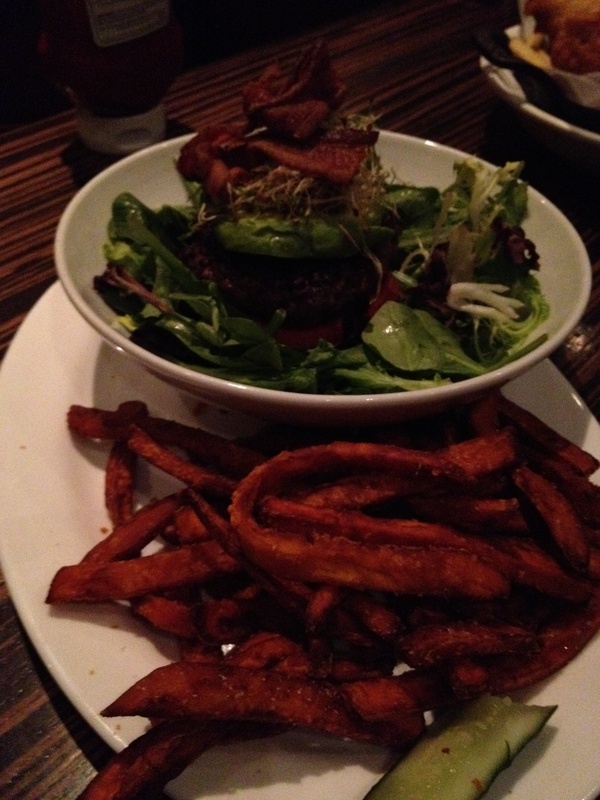 Along side my delicious fries, I had a bun-less burger with avocado and bacon. Yum! I also had a great meal at The Fours. The Fours is known for their sandwiches, which I usually just glance over, but the fine print said that they had gluten free bread! It wasn’t crumbly like normal gluten free bread. 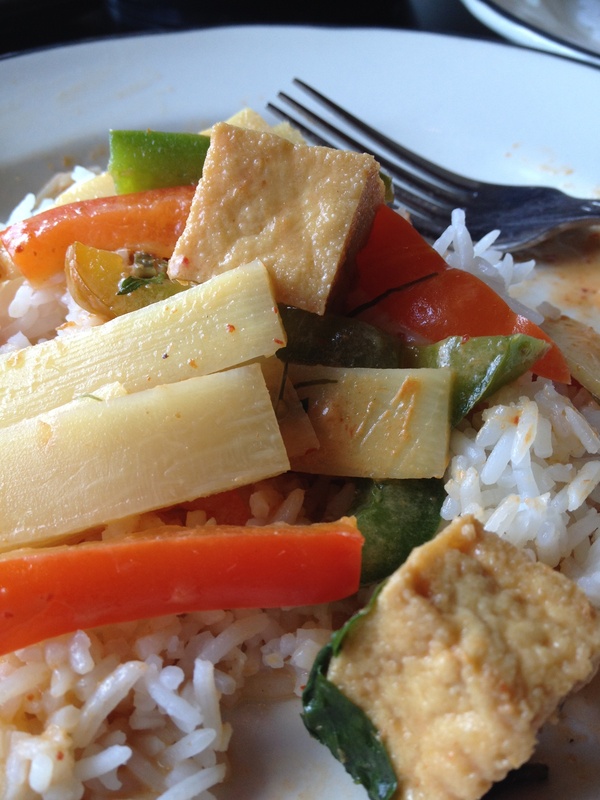 I ate a couple of meals from take out places this week, and needed to share them. They put two of my forbidden foods back on my gluten free plate. 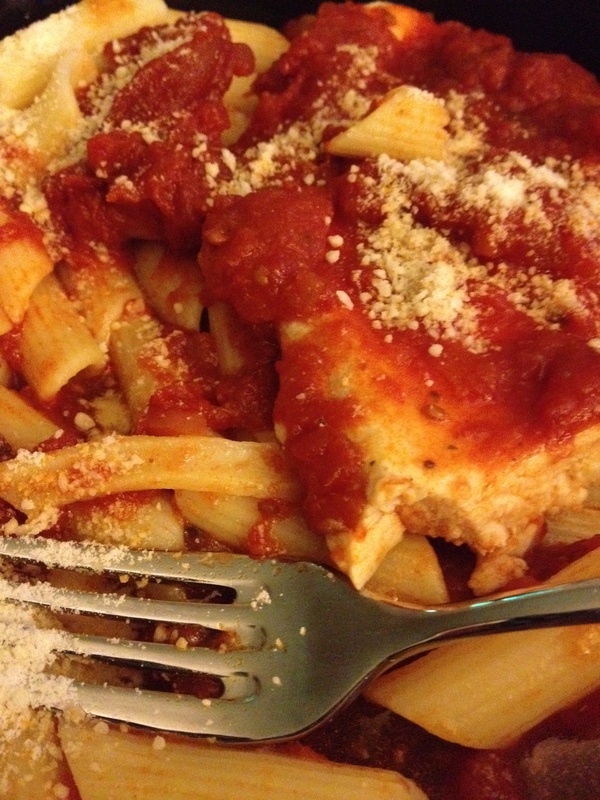 I had pasta and pizza this week… both gluten free, and both phenomenally delicious. I was so impressed and had to share. Earlier this week, I ordered take out dinner from The Chateau in MA. The Chateau does typical family style Italian. It also has a great basic gluten free menu that I obviously needed to try! I ordered gluten free chicken parm with penne. My chicken parm had no cheese on it per request, but I added some grated rice cheese on top when I got home. 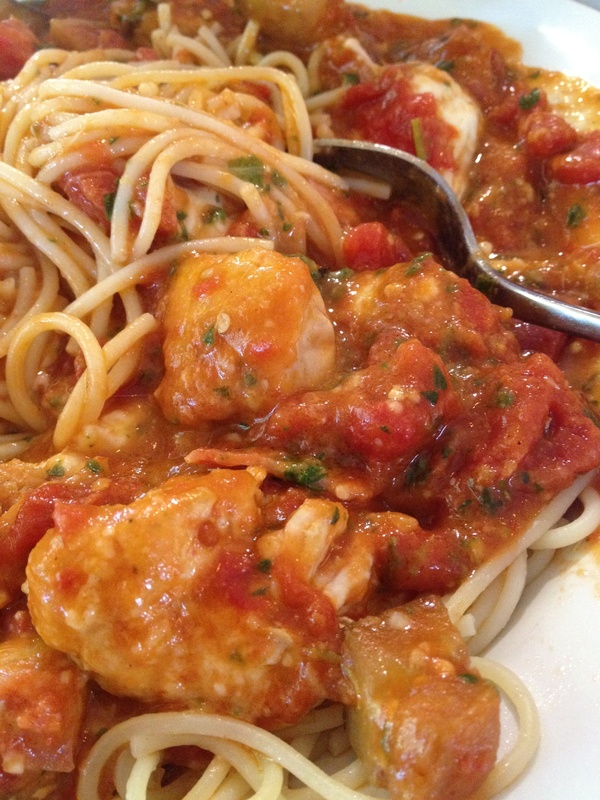 I was so impressed by this meal, that I actually didn’t believe the pasta was gluten free. I kept waiting to get sick! Well done, Chateau! The other gluten free take out I had this week was from Easy Pie in MA. 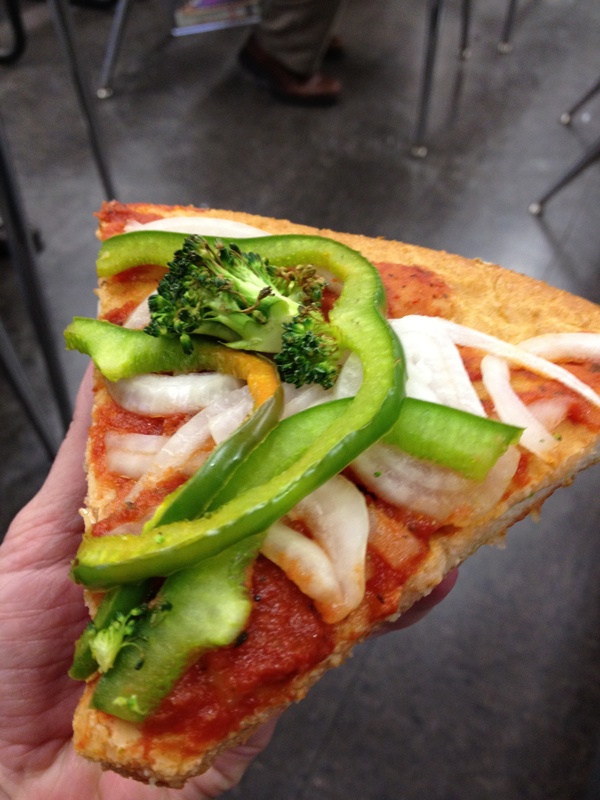 Easy Pie does sandwiches and pizza. In honor of a math teacher’s favorite holiday (Pi Day! ), my colleagues and I shared some pizza pie. Mine was gluten and dairy free, and full of filling veggies. The crust was a perfect pizza crust. I will definitely be back to Easy Pie! 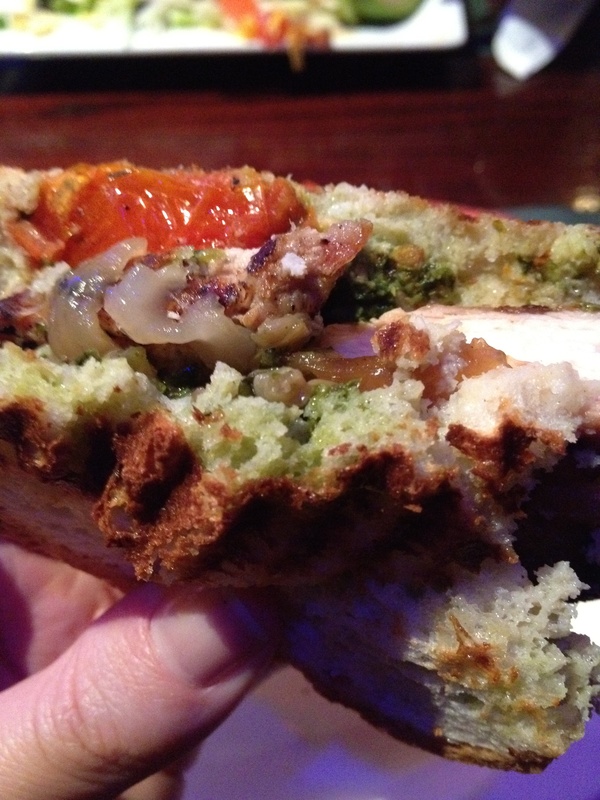 If you live in MA, you should check out these local eateries! 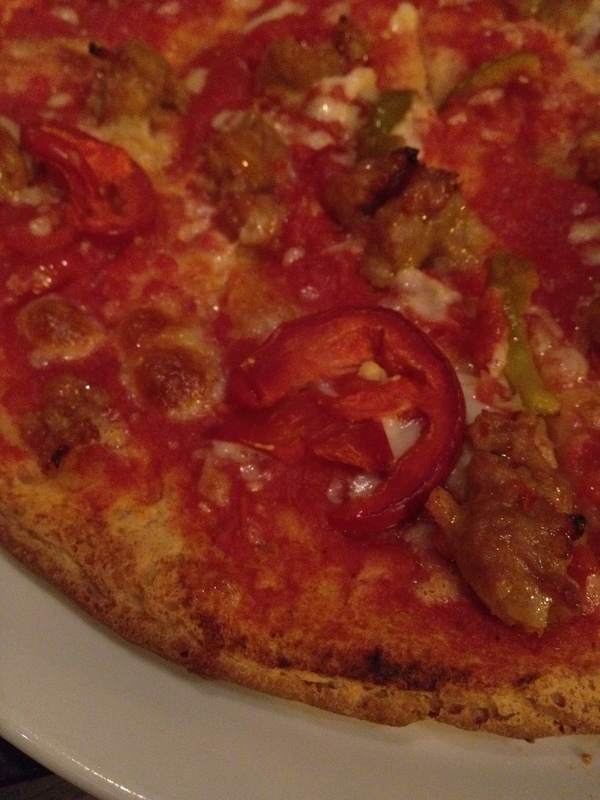 And keep an eye out for other gluten free menus… they are starting to really stand out. People often ask me what I miss the most about having food allergies, and my response is always “pizza and beer.” I have found wonderful gluten free beers, so I don’t even know if that is a fair answer anymore. But, pizza is much harder to find a good substitute for. 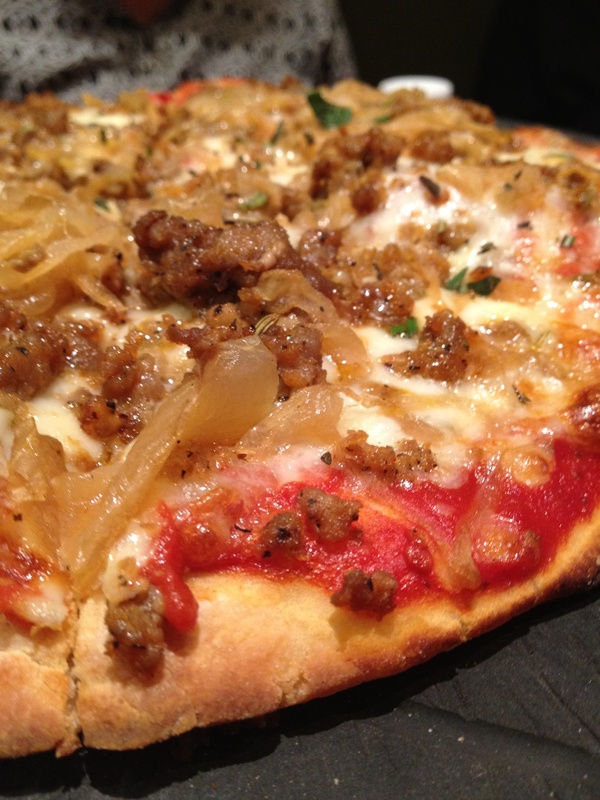 Gluten free pizza dough can be very dry, and very hard to find. 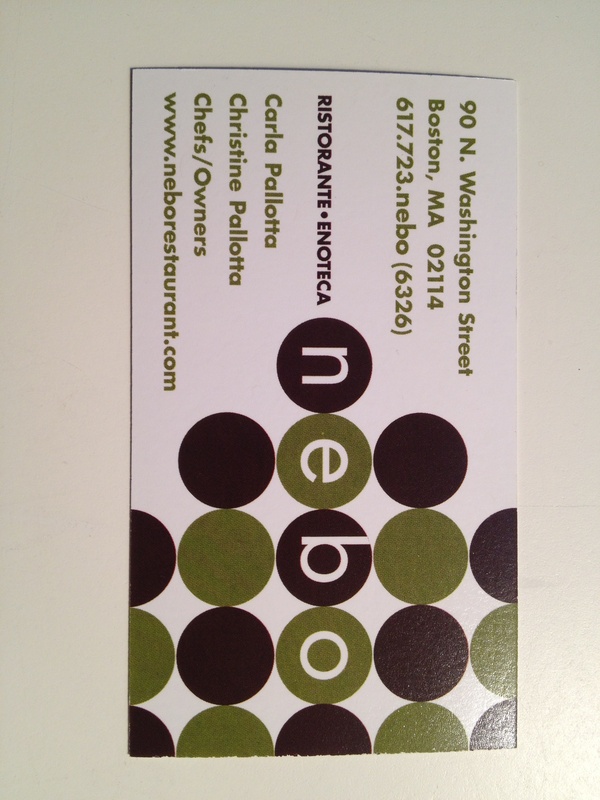 So, you can imagine my surprise when I found out that a North End restaurant, Nebo, has an extensive gluten free menu. Gluten free Italian? Yes, please! It is so hard to find! I went this past Saturday night to Nebo, and was impressed by the ambiance. Dark lighting, impressive bar, buzzing with people. I was so excited to ask for my gluten free menu and find that it was a whole 2 pages long! It had appetizers, entrees, pastas, and pizza. I was in heaven at actually having a choice! 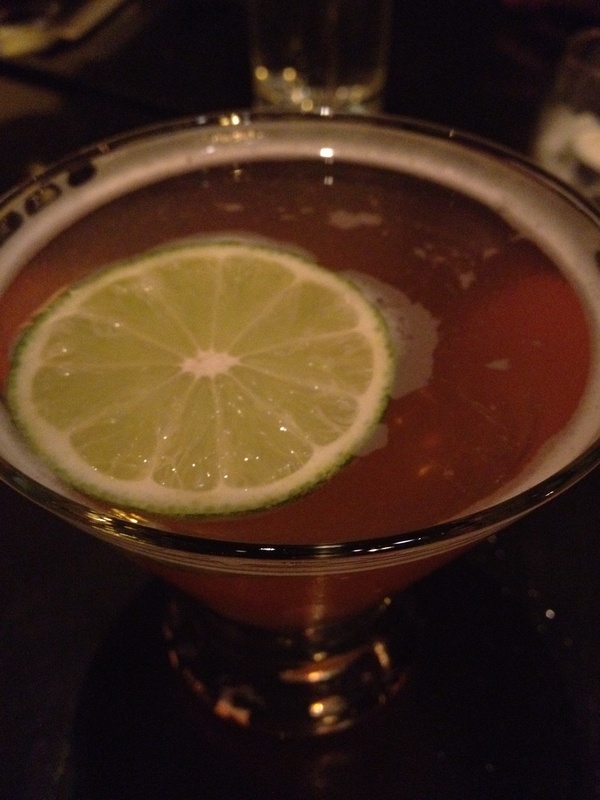 While trying to mull over my choices, I enjoyed a mango cosmo. Deeelicious. What a great flavor idea! After looking at all my choices, I decided on pizza because I rarely can eat it. I ordered my favorite combo, sausage and hot peppers. I also asked for a BARE sprinkle of cheese… but then realized that pizza should be very cheesy or not at all. But the excitement really stopped there. The pizza dough was impressive for gluten free, but the toppings were minimal. I wanted a loaded pizza with my favorite combination, and it just didn’t live up to my expectation. There was only about 1-2 sausage and pepper pieces on each pizza slice. 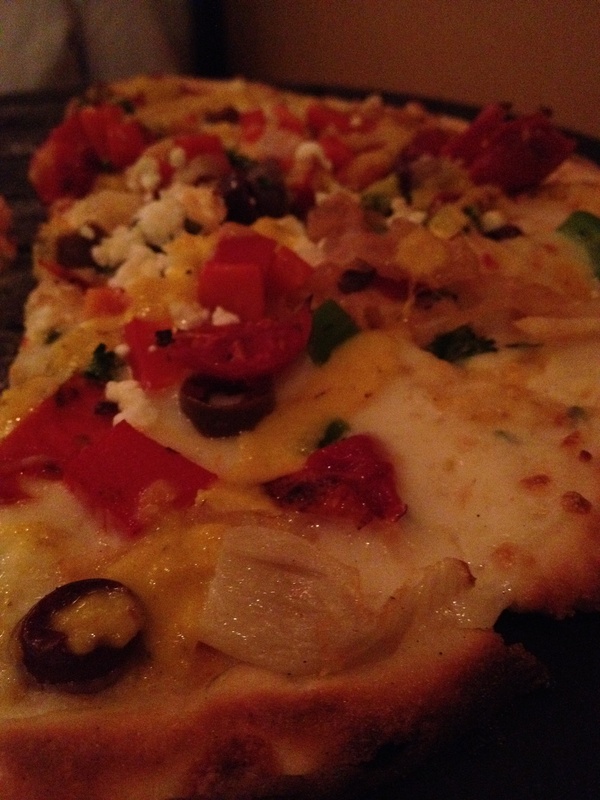 The check was also disappointing… my gluten free pizza was $15 PLUS a $4 surcharge for being gluten free! But it was on the gluten free menu! I hate it when restaurants charge extra for gluten free just because they can since I have no choice. It is the perfect way to bother a customer that could potentially be so excited if you just took good care of their health. So… although it was an adventure, I don’t think I will be back to Nebo anytime soon. I just don’t think that my pizza and cosmo should cost $33 before tip. The food was fine, but it definitely didn’t wow me. Better luck next time! Holidays = food. I had a wonderful time over the holidays spending time with family, and eating my way through a week long vacation! 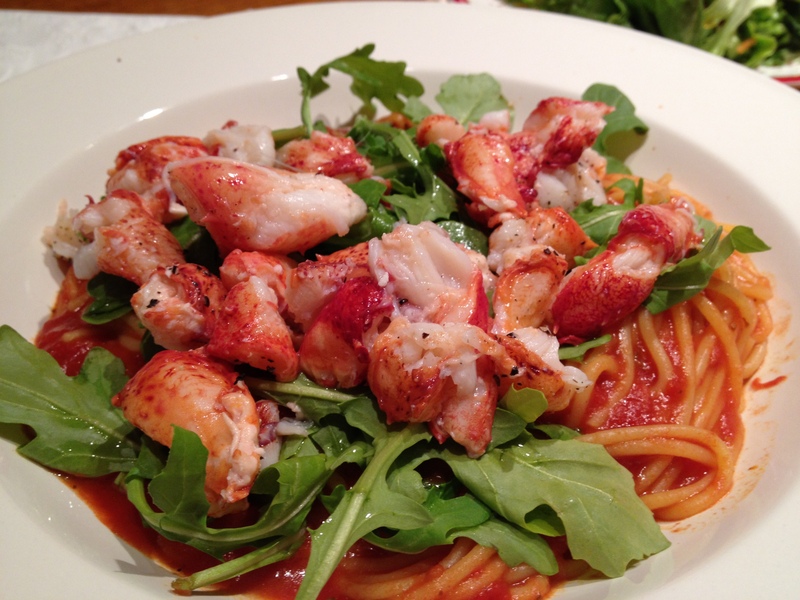 Our annual Christmas Eve meal… fresh lobster over (corn) pasta, highlighted with spicy arugula. 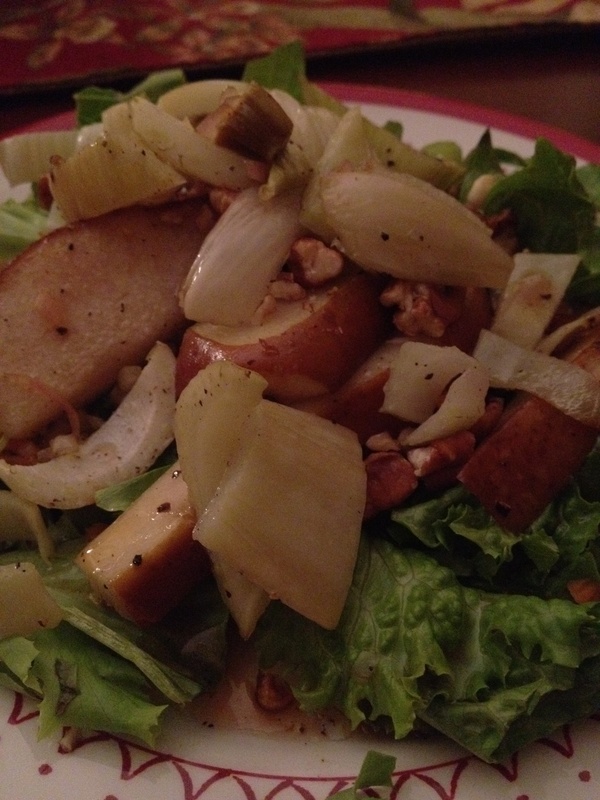 Christmas salad… roasted pear and fennel. 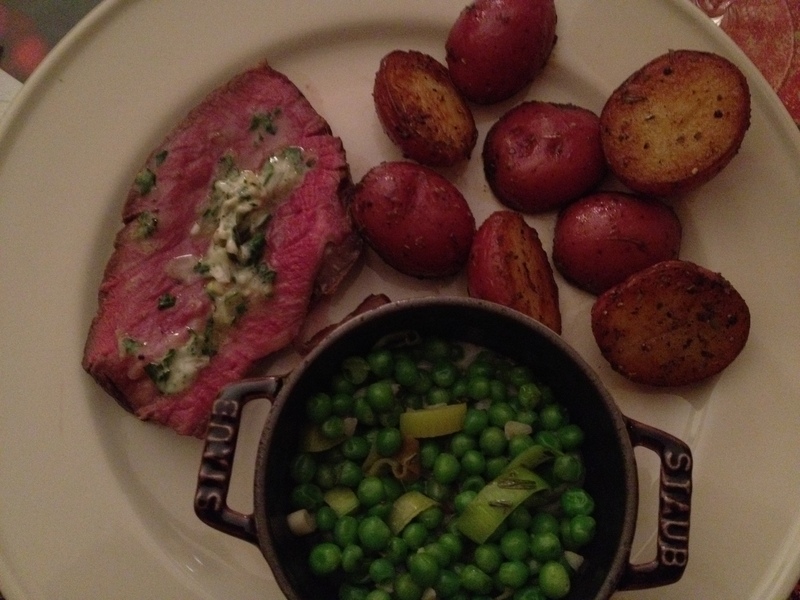 Christmas beef tenderloin with parsley butter, peas, and crispy roasted potatoes. 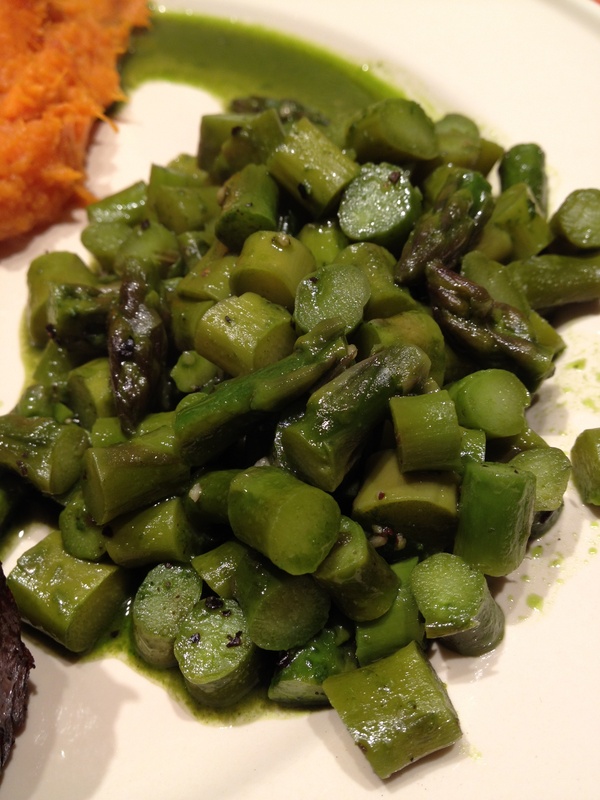 Asparagus coins cooked in parsley water. Serious flavor. 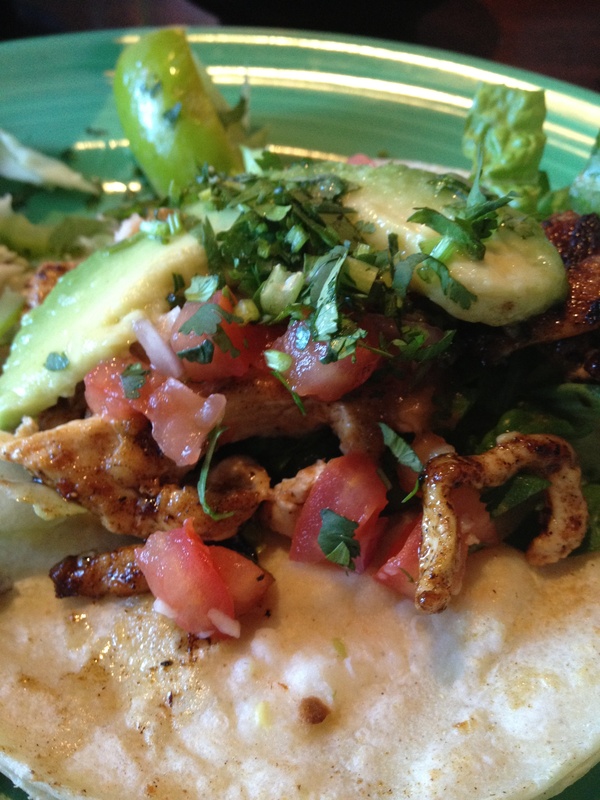 Chicken taco in a gluten free shell! 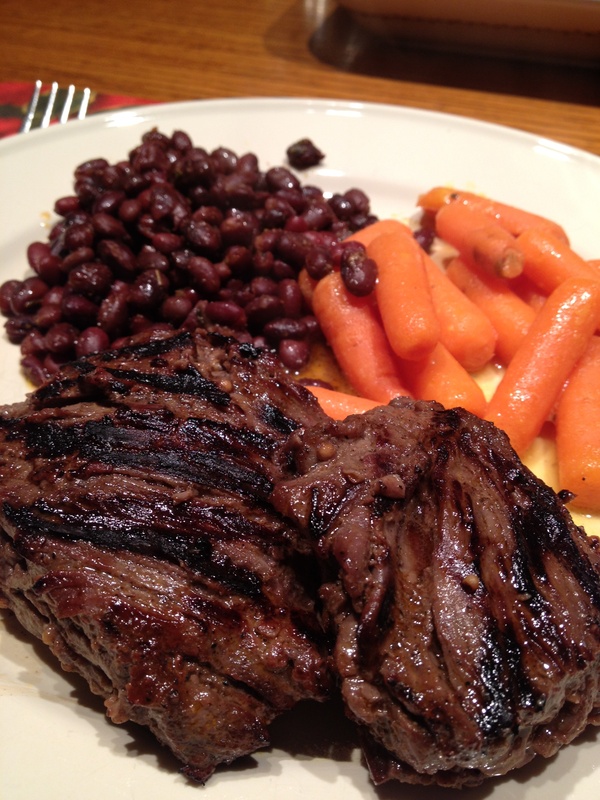 Gluten free steak tips with spicy lime beans and orange glazed carrots. 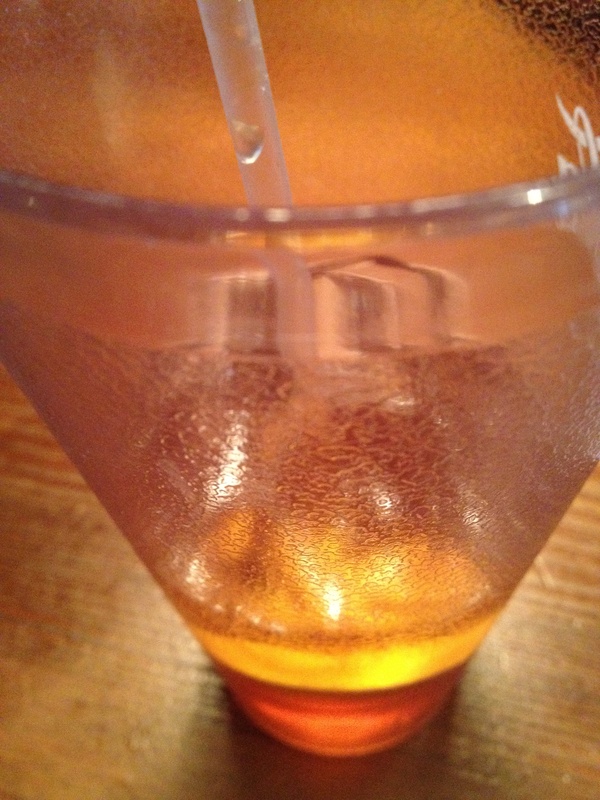 Nothing like washing down some southern meals with sweet tea! This week, my best friend and I went out in Boston to celebrate her birthday. You know you have a great best friend when she asks where you want to go, even though it is her birthday… so thoughtful of my allergies! 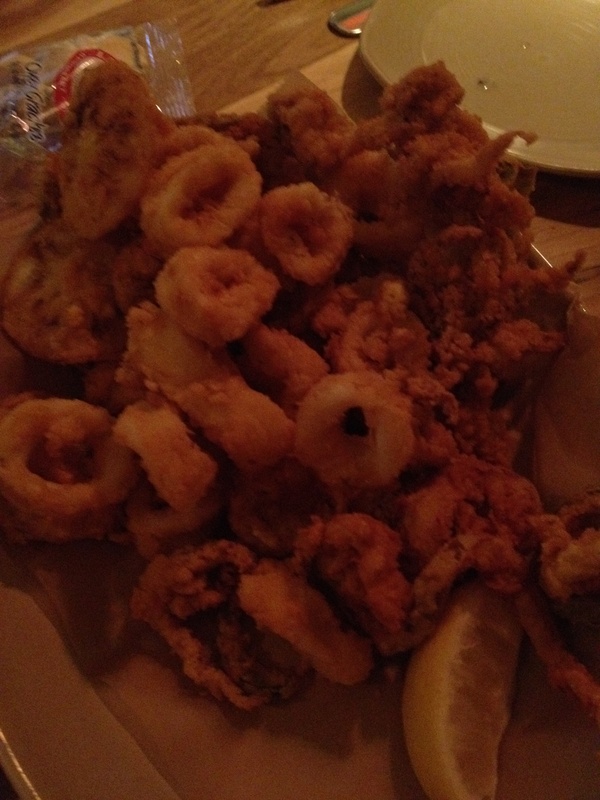 So, we ended up at Legal Sea Food right on the water in Boston. Pretty setting, great company, delicious food! When we sat down, they asked if we had any food allergies. I went though my bit, and the waitress said; “Oh, well we have chick pea flour, so you can also get anything fried.” WHAT?! What an amazing opportunity that I don’t get very often… so naturally we had to try it! They even fried the lemon slices! We were pleasantly surprised. 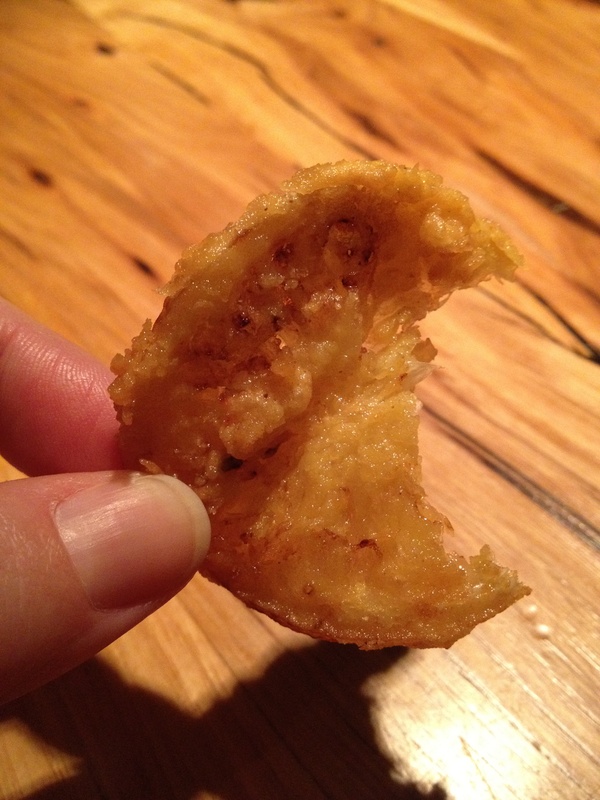 The fried food was light, crispy, and tasted way better than regular deep fried food. Katelyn said she would even try it again even though she doesn’t have to eat gluten free! Thanks, Legal Sea Food! 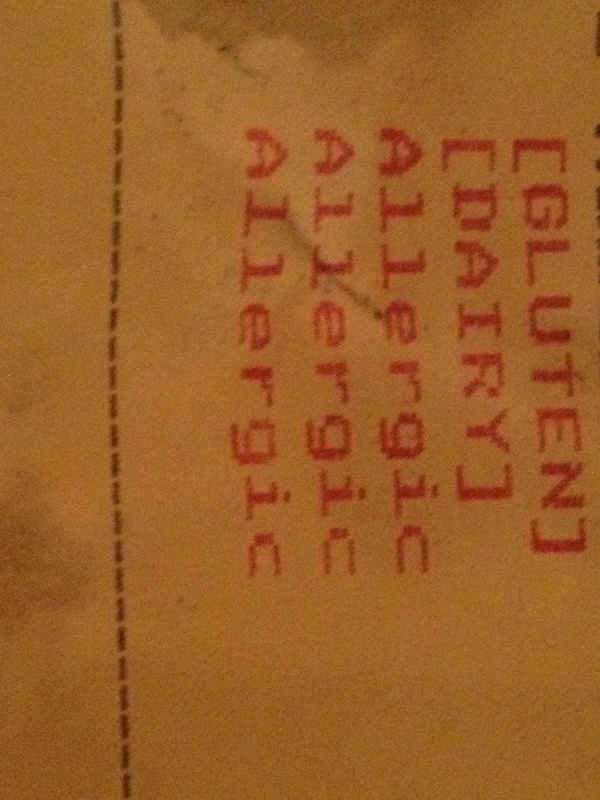 And here is my favorite part… the bottom half of the receipt was very clear on my allergies! With time, this whole eating-out-in-a-restaurant thing is getting better… and it certainly helps when I go to a restaurant that has an entire gluten free menu! Last night, I went to Burton’s Grill. Burton’s already gets high marks in food and atmosphere, but they truly stand out because of their separate gluten free menu. 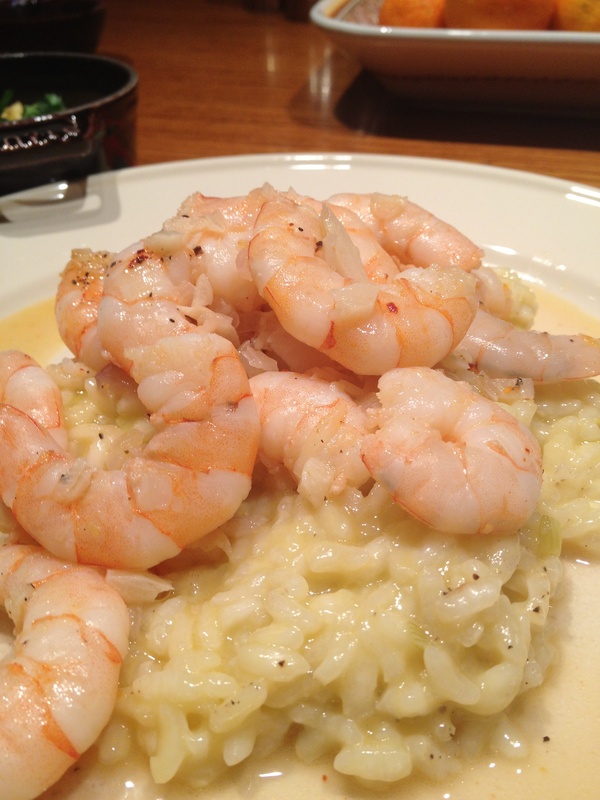 This menu features many of their regular menu items, but with gluten free variations. I love reading my own menu, knowing that I could get anything on it! After I ordered, as usual, a manager came to talk to me about my allergies. He reminded me that all gluten free fare come on square plates, so I know which food is meant for me. He even came back to check on me once my food came out to make sure that everything was to my liking. What a nice feeling! 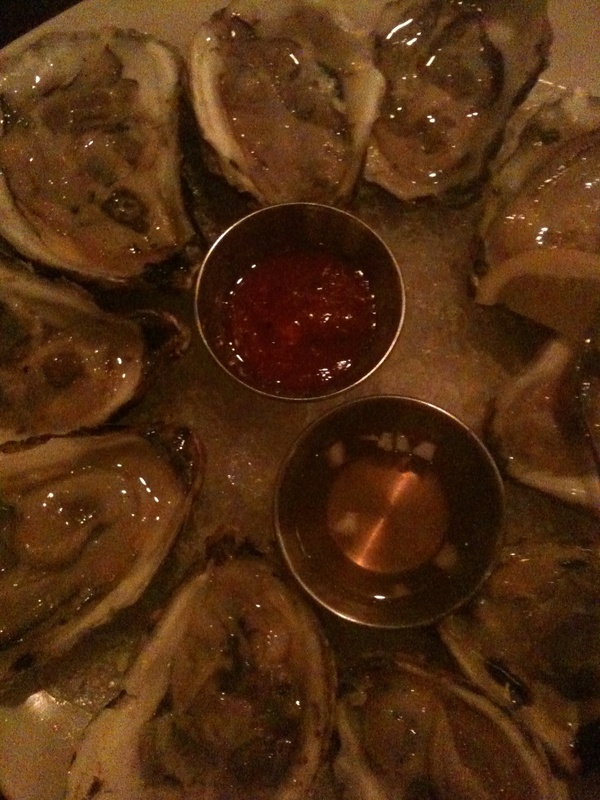 So, on the menu last night was a plate of oysters (naturally gluten free!) and their Land and Sea plate. 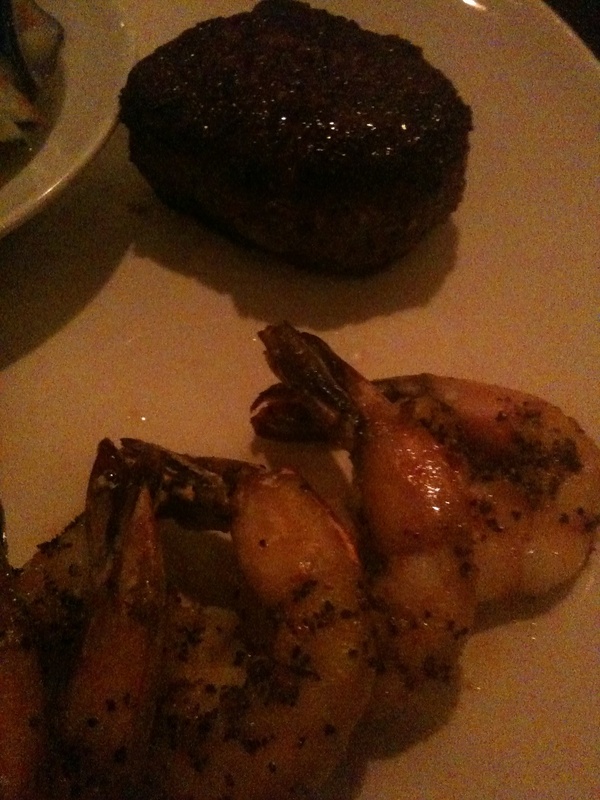 A filet mignon and grilled shrimp, with my choice of 2 sides (from a list of 5). 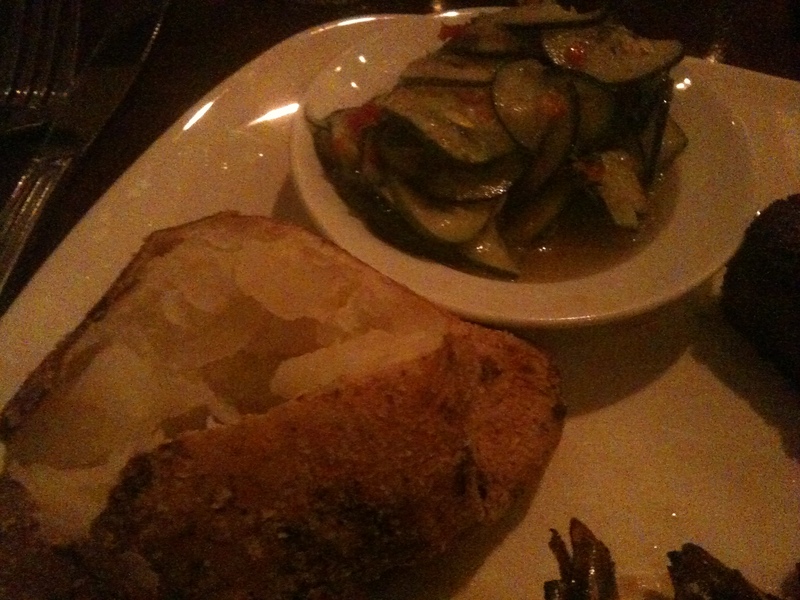 I chose a baked potato and cucumber salad. I was even offered a gluten free roll! On a square plate, of course. Another successful dining experience, thanks to the care taken by Burton’s. I will certainly be back!